Seeing Things Like Horses Do. We see things differently than horses. And like usual, I think we should try to be more like them. To start, one of the easy ways to tell if a mammal is predator or prey is eye position. Predators, like us humans, have our eyes close together, aiding our depth perception and ability to see in 3D, while prey mammals tend to have wide-set eyes with a nearly 360 degree range of vision. They have side-vision on both flanks to see predators. In over-simplified terms, humans scrutinize a small area but horses literally see the big picture. We’re that way about more than just our visual senses. Meaning a rider might say out loud that she has a problem with a canter depart. Or getting bend. Or head tossing. Anyway, as your horse will tell you, saying it out loud is about all it takes to get a fleeting moment-in-time to form up into a totally aggravating thorny little rock that’s impossible to ignore. Humans like to shine a spotlight on such a rock and then go at it with a magnifying glass and tweezers. We fuss and poke at it. We repeat the poking behavior again and again, as if doing the same thing will magically get a different result. Instead we prove our wrongness again and again. Horses, on the other hand, don’t keep secrets well. And they have just one way to communicate with us, and that is with their behavior. So sometimes an honest horse behaves badly and we might try to take control and correct him, when all he wanted us to know was that his back hurt. Or that he was tired. They act out their discomfort in a version of equine charades, trying to get us to listen and we tell them to shut up and keep working. Sigh. It’s so rare that I see a horse willfully disobey. Usually something is hurting them. It could look like simple confusion about the cue but we are so rat-on-a-wheel focused on getting the right answer that we hurry the horse and interrupt him right about the time he was just ready to answer, and then do that a few more times, until the horse is totally out of balance–anticipating and resisting at the same time. Horses really struggle when cues contradict each other. Especially if that something still hurts. But by now you have driven your horse nuts, at least temporarily, because you keep poking at your little thorny rock instead of hearing what he said in the first place. Reminder: If your horse is laid back, calm and never complains about anything, listen extra-carefully. It isn’t that nothing bothers him; he’s just as sensitive as any other horse but when other horses come apart, he shuts down. Don’t mistake his silence for agreement. One of the few things we humans have in common with horses is fluid communication. We have a hundred meanings for the same vague word, just like horses have a hundred meanings for an ear movement. To understand horses, we need to understand that individual horse’s entire body language. It’s a lot to take in, and then it can change in a heartbeat. Any five people might come away with a different, and not entirely wrong, message. Sound complicated? It is, and since we have that razor-sharp mind for turning possible symptoms into huge training issues, half-halt your brain to listen with a wide open, creative intellect. Let your heart have a listen as well. Too often we humans micro-manage a small situation with fear or anxiety or an unrelenting need for perfection. Any horse will get the “I can’t please her no matter how I try” feeling and the conversation stops once we make the horse wrong. Then he gives up connection and we are left staring at our small thorny rock. My advice is to get a horse-sized view of the situation. First, do no harm–is he sound? Don’t just nod, look at the big picture and really check. How are his teeth? They impact his TMJ, and pain in the poll is enough to ruin his balance and that ruins everything else. He can have a “tooth lameness” that destroys his canter. No kidding. Is he muscle or joint sore? It’s another huge question with no quick answer. It would be easier to ignore it, tighten the girth, and push him on. But that might be how you got in this fight in the first place. Then take a wider environmental view. Is a weather front coming? Have there been changes in the barn? Could he be missing someone or up all night partying with a new friend? Is he uncomfortable because his stomach is empty enough that painful acid is splashing? If it isn’t immediately obvious, give him a break. Always know his life is much bigger than the moments you’re in the saddle. A wise vet told me once that diagnosing lameness, (or anything else for that matter,) is like pulling skin off of an onion. There is always another layer just underneath. That’s why it feels like fixing one thing makes another thing come apart. That’s just horses. We’d do well to get used to it because the wider and more inclusive view we take of every aspect of their lives, the better partner we become. Most of all, remember this: Horses are honest. There’s no reason to think he is trying to deceive you and it’s Neanderthal thinking to insist you have to win every fight. Listen and give him the benefit of the doubt. Earn his trust–by trusting him first. And then take a walk together and breathe. More problems are solved at the walk that anyone–but a horse–would ever guess. Please consider following my author blog at www.annablake.com for news of my upcoming book. Thanks for your support. ← Reading and Writing and Waiting. You are,as always, so right…You are a wonderful teacher. Thank you for being so inspiring. Well, someone is a wonderful teacher, I just ‘trickle’ it down. But thanks. I get ‘right’ eventually, because I keep learning from the best teachers in the world. Thanks to them. Just the other day I was out on the trail with my horse. It was icy but the edges of the trail weren’t too bad. He began weaving from one edge of the trail to the other. I stopped him from doing this because it was making me dizzy. Then HE stopped, did a quiet, easy 180° and started back the way we came. What did I do? Went with him. He was tired of having to be so careful about the ice and I know him well enough to trust his judgment. You are a lucky horse owner, but not as lucky as he is. Thanks. Thank you, thank you, thank you! I get so frustrated with riders pulling on their horse’s face while kicking them- then when they go, they keep kicking– and blaming the “stupid” horse for everything that is going wrong. I hear that, it makes our heart as sore as our eyes to watch. Thanks for the comment. I love your understanding and kindness, Anna. I forwarded this to a friend of mine who has a horse (the one I made buy a horse to be friends with my Woodrow). Her guy is about 30 yrs old now and isn’t ridden any more, but I know she’ll like this. Now, would you please teach all the people in the world to behave this way with each other? I would greatly appreciate that! As always, great advice! How can our horses trust us if don’t give them the benefit of the doubt and trust them to show us what physical or mental issue they may need help with?!? True partners listen to each other. Wow, this may be one of my favorite posts ever! I couldn’t agree more, but don’t have half your talent in explaining it all… I’ve shared on FB and pinned for all my students to read. Thank you! It’s because my horses and my client’s horses have patiently explained it to me. They say thanks. I love this woman. I wish she was closer but I am thankful she publishes these amazing posts. As a seasoned horse expert she supports everything that we believe with our girls. Thank God! I love you my best partner for life. Thank you, Fred. You have lucky horses. Love this Post! Thankfully its getting more popular to listen to our horses. When I tell people my horse is much easier to work with if you talk to her and ask, they are astonished at the information she comes across with, the more you listen the more they are encouraged to engage in a conversation. Heheh, exactly. Once you show a horse you are willing to listen, the more they never shut up! I just love that about horses. I always enjoy reading your blog. Very thought provoking. I look forward to reading more . I have much to learn about horses. This is so true. 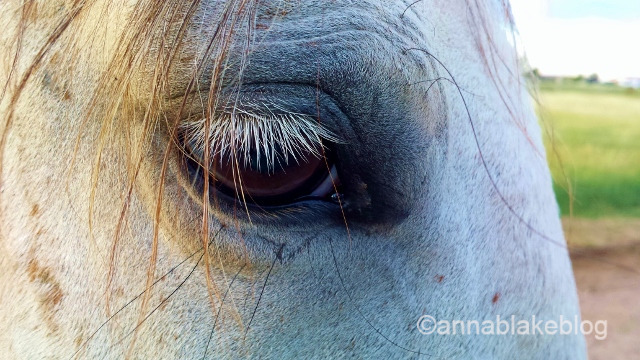 I am – well – a “few” years older now but I’ve never forgotten one lesson a horse taught me. I was leasing him and he was generally an easy-going horse but one day as I saddled him he blew up making it hard to tighten the girth well. It wasn’t typical for him so I should have paid attention, but I took it as him just not wanting to work that day. I pushed him and I wasn’t in the saddle for 5 minutes before he bucked, having never acted that way before. I ended up with a sprained ankle (lucky it wasn’t more.). Turned out he had a really sore spot on his back and the saddle surely put pressure on it. He tried to tell me before we both got hurt but I wasn’t listening. Valuable teaching for me at poor Mister’s expense though he did get treated with an anti-inflammatory and rest and was fine in a few days. So many lessons we learn if we get better at listening over the years! Best trainers in the world. But we have to be trainable. Good job! I like this essay very much. Thank you, and thanks for visiting us.